Blueprint Gaming releases a new game, Wolf Legend Megaways. At first glance players will realize the similar design and mechanics to other big hits from Blueprint that were released lately, so players should know the potential is a big one the same as it is with the other Blueprint slots releases. Even if the resemblance is noticeable, Wolf Legend Megaways has a different math behind the game, so the RTP and max win is modified, so this is not a clone of similar slots. Looking at the slot game, we will see that it has 6 reels and like other megaways slots it has a maximum ways to win of 117,649 ways. Well we want to see the ways fully expanded and making some connections with premium symbols, cause this slot can pay up to 50.000x the bet size, so lucky players should have a go and see if they can land a good combination and hit a big win on it. 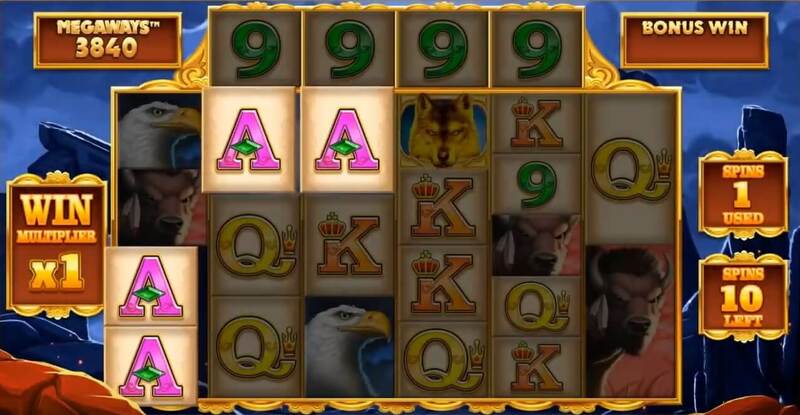 Wolf Legend Megaways slot has all the normal symbols we are used to, 10 to A being the low paying symbols and the premium ones here are the Eagle, Buffalo, Cougar and of course we also have the Wolf as the best paying symbol (50x the stake for 6 on all reels). Players will also notice a Mystery Symbol which can transform to any symbol except the scatter ones. By landing 3 or more Scatters, players will trigger the bonus round.There is no set number of spins for landing the scatters. In this slot game each bonus will award different random number of spins and players can gamble the spins they get before the bonus starts. Players also have the opportunity to buy the bonus if they don't want to play the base game. The cost for buying the bonus round is 75x the bet size, so if a player has a bet of 2 euros per spin, the bonus buy will cost 150 euros. Not that expensive but also not that cheap, but keep in mind this slot has a potential of 50.000x so gambling 150 euros with a 2 euro bet size can award the player with a 100.000 euros win if he is insanely lucky. Wolf Legend Megaways slot has a 96.21% RTP and it is a High Variance slot game with up to 117,649 Megaways on bet sizes from 0.10 up to 10 euros and a maximum win potential of 50,000x the bet size capped at 250.000 british pounds.